05/09/18 Toyota motor engineering & manufacturing (toyota) is recalling certain 2018 toyota camry and highlander vehicles, 2017 toyota sienna and tacoma vehicles and 2017 lexus rx350 vehicles. during the manufacturing process, the oil galley in the rotor for the brake booster vacuum pump assembly may have been improperly machined possibly resulting in a sudden loss of brake assist. 01/29/18 Toyota motor engineering & manufacturing (toyota) is recalling certain 2013 scion xb, toyota corolla, corolla matrix, sienna, 4runner, lexus is250, is350, is250c, is350c, is-f, and gx460 vehicles sold, ever registered, in the states of al, ca, fl, ga, hi, la, ms, sc, tx, pr, as, gu, the mp (saipan), and the u.s. vi or "zone a." toyota is also recalling certain 2010 scion xb, toyota corolla, corolla matrix, yaris, 4runner, lexus is250, is350, is250c, is350c, es350, is-f, gx460, and pontiac vibe vehicles sold, ever registered, in the states of az, ar, de, dc, il, in, ks, ky, md, mo, ne, nv, nj, nm, nc, oh, ok, pa, tn, va, and wv or "zone b." toyota is also recalling certain 2009 scion xb, toyota corolla, corolla matrix, yaris, lexus is250, is350, es350, is-f, and pontiac vibe vehicles ever registered in the states of ak, co, ct, id, ia, me, ma, mi, mn, mt, nh, ny, nd, or, ri, sd, ut, vt, wa, wi, and wy or "zone c." these vehicles are equipped with certain air bag inflators assembled as part of the passenger frontal air bag modules used as original equipment or replacement equipment. in the event of a crash necessitating deployment of the passenger frontal air bag, these inflators may explode due to propellant degradation occurring after long-term exposure to absolute humidity and temperature cycling. 02/01/17 Toyota motor engineering & manufacturing (toyota) is recalling certain 2012 toyota 4runner, corolla, corolla matrix, sienna, yaris, scion xb, lexus es350, gx460, is-f, is250, is350, is250c, is350c, and lexus lfa vehicles originally sold, or ever registered, in alabama, california, florida, georgia, hawaii, louisiana, mississippi, south carolina, texas, puerto rico, american samoa, guam, the northern mariana islands (saipan), and the u.s. virgin islands, or "zone a." additionally, unless included in "zone a" above, toyota is recalling certain 2009 toyota corolla, corolla matrix, yaris, yaris hb, scion xb, pontiac vibe, lexus, es350, is250, is350, and is-f vehicles originally sold, or ever registered, in arizona, arkansas, delaware, district of columbia, illinois, indiana, kansas, kentucky, maryland, missouri, nebraska, nevada, new jersey, new mexico, north carolina, ohio, oklahoma, pennsylvania, tennessee, virginia, and west virginia, or "zone b." additionally, unless included in "zone a" or "zone b" above, toyota is recalling certain 2006-2008 lexus is250 and is350, 2007-2008 lexus es350, toyota yaris, yaris hb, and 2008 lexus is-f and scion xb vehicles originally sold, or ever registered in alaska, colorado, connecticut, idaho, iowa, maine, massachusetts, michigan, minnesota, montana, new hampshire, new york, north dakota, oregon, rhode island, south dakota, utah, vermont, washington, wisconsin and wyoming. these vehicles are equipped with certain air bag inflators assembled as part of the passenger frontal air bag modules used as original equipment or replacement equipment. in the event of a crash necessitating deployment of the passenger frontal air bag, these inflators may rupture due to propellant degradation occurring after long-term exposure to absolute humidity and temperature cycling. 11/18/16 Toyota motor engineering & manufacturing (toyota) is recalling certain model year 2008-2011 scion xb and lexus is f, 2009-2011 toyota corolla and corolla matrix, 2006-2011 toyota yaris, lexus is250 and lexus is350, 2010-2011 toyota 4runner, lexus is250c, lexus is350c and lexus gx460, 2011 sienna, 2007-2011 lexus es350, and 2009-2010 pontiac vibe vehicles, originally sold, or ever registered, in alabama, california, florida, georgia, hawaii, louisiana, mississippi, south carolina, texas, puerto rico, american samoa, guam, the northern mariana islands (saipan), and the u.s. virgin islands, or "zone a." additionally, unless included in "zone a" above, toyota is recalling certain model year 2008 scion xb and lexus is f, 2007-2008 toyota yaris, 2006-2008 lexus is250 and lexus is350 and 2007-2008 lexus es350 vehicles, originally sold, or ever registered, in arizona, arkansas, delaware, district of columbia, illinois, indiana, kansas, kentucky, maryland, missouri, nebraska, nevada, new jersey, new mexico, north carolina, ohio, oklahoma, pennsylvania, tennessee, virginia, and west virginia, or "zone b." vehicles of these model years and models that were not originally sold or ever registered in either zones a or b are not subject to this safety recall. these vehicles are equipped with certain air bag inflators assembled as part of the passenger frontal air bag modules, and used as original equipment or replacement equipment. in the event of a crash necessitating deployment of the front air bags, these inflators may rupture due to propellant degradation occurring after long-term exposure to absolute humidity and temperature cycling. 11/17/14 Toyota motor engineering & manufacturing (toyota) is recalling certain model year 2014 toyota avalon, camry, sienna, and highlander and model year 2015 lexus rx350 vehicles. fuel may leak from the one of the fuel delivery pipes in the engine compartment. Toyota will notify owners, and dealers will replace any of the suspect fuel delivery pipes free of charge. the recall began november 17, 2014. owners may contact toyota customer service at 1-800-331-4331. 08/05/14 Toyota motor engineering & manufacturing (toyota) is recalling certain model year 2014 sienna vehicles manufactured june 17, 2014, through june 24, 2014. the affected vehicles have a transmission shift control cable whose protective cable sleeve may have been damaged during assembly. this could cause the control cable to bind or separate during gear shift operation causing incorrect gear selection. as such, these vehicles fail to comply with the requirements of the federal motor vehicle safety standard no. 102, "transmission shift lever sequence, starter interlock, and transmission braking effect." 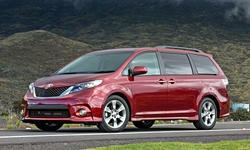 01/27/11 Toyota is recalling certain model year 2011 sienna vehicles. the brake stop lamp switch is mounted on a small bracket welded on the left side of the service brake pedal support assembly. due to its proximity to the parking brake pedal, in limited circumstances the stop lamp switch bracket could be damaged by the operator's foot during parking brake application. Toyota safety recall no. aop.owners may also contact the national highway traffic safety administration's vehicle safety hotline at 1-888-327-4236 (tty 1-800-424-9153), or go to http://www.safercar.gov . 08/18/03 On certain sport utility vehicles, a part of the fuel tank may become damaged when crashed in the insurance institute for highway safety's (iihs) 40 mph frontal offset crash test conditions, due to the severe impact forces generated. If the fuel tank becomes damaged and fuel leakage occurs, a fire may result in the presence of an ignition source. Dealers will replace the fuel tank. owner notification began august 1, 2003. owners should contact toyota at 1-800-331-4331. Toyota recall no. ssc 30k.customers can also contact the national highway traffic safety administration's auto safety hotline at 1-888-dash-2-dot (1-888-327-4236). 12/31/11 Engine Toyota is recalling certain model year 2004 avalon vehicles; 2004 and 2005 camry, camry solara, highlander, and sienna vehicles, 2006 highlander hybrid; 2004 and 2005 lexus es330 and rx330; and 2006 lexus rx400h vehicles manufactured from june 1, 2004 through march 31, 2005, equipped with the 1mz-fe or 3mz-fe engine. the amount of adhesive agent applied between the outer ring and the torsional rubber damper (inner ring) in the crankshaft pulley may be inadequate. if the adhesive is insufficient, there is a possibility that the outer ring may become misaligned and it may not properly rotate with the inner ring, causing noise and/or illumination of the battery discharge indicator light. Toyota will notify owners, and dealers will check the crankshaft pulley to identify whether it was produced by the u.s. supplier. if so, the dealer will replace the pulley with a new one at no charge. the safety recall is expected to begin during early january 2012. owners may contact toyota at 1-800-331-4331. 12/13/17 Transmission and Drivetrain Toyota motor engineering & manufacturing (toyota) is recalling certain 2005-2007 and 2009-2010 toyota sienna vehicles. in the affected vehicles, due to a problem within the shift lock assembly, the shift lever may be moved out of the 'park' position without depressing the brake pedal. Toyota will notify owners, and dealers will replace the shift lock solenoid and reapply the grease, free of charge. owners may contact toyota customer service at 1-800-331-4331. toyota's number for this recall is h0v. vehicles that were previously recalled under campaign 13v-429 are not affected by this recall. 02/27/14 Transmission and Drivetrain Toyota is recalling certain model year 2004-2005 sienna vehicles manufactured january 10, 2003, through august 10, 2005; and model year 2007-2009 sienna vehicles manufactured february 20, 2007, through december 12, 2008. in the affected vehicles, due to a problem within the shift lock solenoid, there is a possibility that the shift lever could be moved out of park position without depressing the brake pedal. Toyota will mail interim notifications to owners beginning in late october 2013. when parts are available, owners will be sent a second notice and dealers will replace the shift lock solenoid, free of charge. owners may contact toyota at 1-800-331-4331. 06/22/11 Transmission and Drivetrain Toyota is recalling certain model year 2011 venza and sienna passenger cars manufactured from march 7, through march 10, 2011. there is a possibility that the front, right, drive shaft may break due to insufficient heat treatment. Should the drive shaft break during vehicle operation, the vehicle will lose power without prior warning. loss of motive power without warning may increase the risk of a crash. Toyota will notify owners and dealers will inspect the drive shaft, and, if the drive shaft is identified as one that may not have been correctly manufactured, it will be replaced with a new one at no charge. the safety recall began on june 22, 2011. owners may contact toyota at 1-800-331-4331. 01/15/15 Electrical and Air Conditioning Toyota motor engineering & manufacturing (toyota) is recalling certain model year 2015 sienna vehicles manufactured september 2, 2014, to november 25, 2014. in the event of a crash that necessitates the deployment of the curtain shield airbag (csa), the second row overhead assist grips may detach. If the assist grip detaches due to csa deployment, the grip may strike a vehicle occupant, increasing the risk of injury. Toyota will notify owners, and dealers will modify the headliner near the second row overhead assist grip, free of charge. the recall began on january 15, 2015. owners may contact toyota customer service at 1-800-331-4331. 01/26/09 Electrical and Air Conditioning Toyota is conducting a safety improvement campaign involving 26,501 early 2004 my sienna vehicles. in the event the retention clip used to secure the floor carpet cover is missing, the cover can interfere with the operation of the accelerator pedal if the acceleration pedal is depressed to nearly the full throttle position. If this occurs, the accelerator pedal can become stuck which could result in a vehicle crash. Dealers will replace the retention clip and floor carpet cover at no charge. the campaign began on january 26, 2009. owner notification is expected to be completed by early april 2009. owners may contact toyota at 1-888-270-9371, if they have any further questions. This action is deemed a safety improvement campaign and is not being conducted under the safety act. however, toyota has informed nhtsa that it will provide the modifications described above at no cost. 04/20/18 Other Toyota motor engineering & manufacturing (toyota) is recalling certain 2018 toyota sienna vehicles built with a specific lot of 10-spoke alloy wheels from one production facility. these wheels may not have been properly cooled during manufacturing. as a result, the wheels may crack in the spokes from an impact while driving. If the wheels crack at the spokes, the wheel may separate from the hub assembly causing a loss of vehicle control and increasing the risk of a crash. Toyota began notifying owners initially by phone on february 26, 2018 and will mail letters to any unnotified owner starting on april 20, 2018. dealers will inspect the wheels and replace them if necessary depending on their production location, free of charge. owners may contact toyota customer service at 1-888-270-9371. toyota's number for this recall is j0j. 07/28/17 Other Toyota motor engineering & manufacturing (toyota) is recalling certain model year 2011-2016 toyota sienna minivans manufactured january 4, 2010, to august 12, 2016. if the power sliding door is unable to be opened when commanded, such as if the door is frozen shut, the door may subsequently open unexpectedly, possibly while the vehicle is moving. Toyota will notify owners, and dealers will replace the junction block, rear sliding door wire harnesses, and install two sub wire harnesses, free of charge. the recall began on july 28, 2017. owners may contact toyota customer service at 1-800-331-4331. toyota's number for this recall is g04. 04/29/16 Other Toyota motor engineering & manufacturing (toyota) is recalling certain model year 2016 toyota sienna vehicles manufactured february 15, 2016, to february 19, 2016. in the affected vehicles, incorrect front seat belt height adjusters may have been installed. during a crash, this incorrect height adjuster may contact the b-pillar and tear or separate. Failure and detachment of seat belt height adjuster would result in the occupant not being properly restrained in a crash, increasing their risk of injury. Toyota will notify owners, and dealers will replace the front seat belt height adjusters, free of charge. the recall began on april 29, 2016. owners may contact toyota customer service at 1-800-331-4331. toyota's number for this recall is g0h. 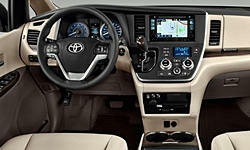 06/05/15 Other Gulf states toyota, inc. (gst) is recalling certain model year 2015 toyota sienna vehicles manufactured january 23, 2015, to april 13, 2015, and equipped with non-toyota-brand overhead entertainment accessories installed by gst. during reassembly of the interior after the overhead entertainment system installation, a trim panel securing clip may have been reused instead of being replaced. If the clip was damaged during the entertainment system installation, in the event of a side curtain air bag deployment, the trim panel may detach and strike one of the vehicle occupants, increasing the risk of injury. Gst will notify owners, and dealers will replace the trim panel securing clip, free of charge. the recall began june 5, 2015. owners may contact gst customer service at 1-800-444-1074. gst's number for this recall is 15r1. 05/22/15 Other Southeast toyota distributors, llc (set) is recalling certain model year 2015 sienna vehicles manufactured september 1, 2014, to april 13, 2015 and equipped with overhead entertainment accessories installed by set. during reassembly of the interior after the overhead entertainment system installation, a trim panel securing clip may have been reused instead of being replaced. Set will notify owners, and dealers will replace the trim panel securing clip, free of charge. the recall began on may 22, 2015. owners may contact set customer service at 1-866-405-4226. set's number for this recall is set15b. 01/31/12 Other Toyota is recalling certain model year 2011 through 2012 sienna vehicles for failing to comply with the requirements of federal motor vehicle safety standard number 110, "tire selections and rims." these vehicles do not meet the requirement for displaying the correct vehicle capacity weight as the rated load for the combination of cargo and occupants. Incorrect information on the vehicle placard may lead to tire overloading and possibly cause tire failure increasing the risk of a crash. Toyota will notify owners, and will provide a remedy when it is available. toyota will mail out a corrected placard to customers along with revised owner manual information. this service will be performed free of charge. the safety recall began on june 27, 2013. owners may contact toyota at 1-800-331-4331. 10/12/10 Other Toyota is recalling certain model year 1998 through 2010 sienna passenger vehicles manufactured between august 7, 1997 and january 4, 2010, currently registered in or originally sold in connecticut, delaware, illinois, indiana, kentucky, maine, maryland, massachusetts, michigan, minnesota, new hampshire, new jersey, new york, ohio, pennsylvania, rhode island, vermont, washington district of columbia, virginia, west virginia, and wisconsin. the subject vehicles are equipped with the spare tire stowed under the vehicle. if the vehicle is operated in the cold climate regions of the united states where road salt is frequently used, water splashed backwards with high concentrations of road salt can reach the spare tire carrier and corrode the spare tire carrier assembly cable. Toyota recall no. aoe.owners may also contact the national highway traffic safety administration's vehicle safety hotline at 1-888-327-4236 (tty 1-800-424-9153), or go to http://www.safercar.gov . 12/10/09 Other Toyota is recalling certain model year 2006 through 2009 sienna and 2009 lexus gx passenger vehicles. the vehicle capacity weight on the tire and loading information label and the gvwr on the certification label is insufficient for certain vehicles. some vehicles were accessorized through vehicle processing centers and had accessories installed that caused the vehicle to exceed the gvwr value. these vehicles fail to comply with the requirements of federal motor vehicle safety standard no 110, "tire selection and rims," and 49 cfr part 567. The gvwr is insufficient for the load carrying capacity of the vehicles. Toyota will notify owners instructing them to return their vehicle to a toyota or lexus dealer for an exchange of the certification label and the tire and loading information label, an installation of the load carrying capacity modification label, if necessary, and a correction to the owner's manual. this remedy will be performed free of charge. the safety recall began on december 10, 2009. owners may contact toyota at 1-888-270-9371. Recall number ssc 9lf.owners may also contact the national highway traffic safety administration's vehicle safety hotline at 1-888-327-4236 (tty 1-800-424-9153), or go to http://www.safercar.gov . 08/05/05 Other On certain mini vans, in the middle row seating position, the shoulder portion of the seat belt may bind in the bezel trim piece. the affected seat belt bezel is located on the shoulder portion of the seat in the right side seat of the seven passenger models and the center seating position in the eight passenger models. If the seat belt binds in the bezel, that extra webbing may exist in the seat belt which could result in an improperly fitted seat belt on a passenger. in the event of a crash, a seat occupant may not be properly restrained increasing the risk of personal injury. Dealers will replace the seat belt bezel and clip. the recall began august 5, 2005. owners may contact toyota at 1-800-331-4331. Toyota recall no. 50l.customers may also contact the national highway traffic safety administration's vehicle safety hotline at 1-888-327-4236; (tty: 1-800-424-9153); or go to http://www.safercar.gov. 04/09/01 Other Vehicle description: passenger vehicles. the front sub frame assembly has not been adequately welded. This condition could cause failure of the assembly following long-term usage, increasing the risk of a crash. Dealers will inspect and replace the front sub frame, if necessary. owner notification began april 9, 2001. owners who take their vehicles to an authorized dealer on an agreed upon service date and do not receive the free remedy within a reasonable time should contact toyota at 1-800-331-4331.